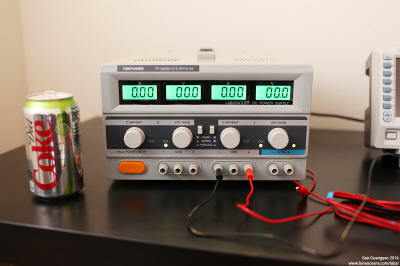 I was in the market for a proper DC bench power supply for testing some of my circuits instead of using batteries and regulators or variacs, so I decided to look around for one without costing too much. I eventually went for a Tekpower TP3005D-3 which I got on Amazon for $185 shipped. The TP3005D-3 is a basic 3-channel 30V 5A DC bench power supply, but is it any good? Let's find out in this quick review! In this page I will describe the motivations and reasoning behind my choice for this supply, what my expectations were, its general electrical performance, internal construction, and what I think of the supply overall. 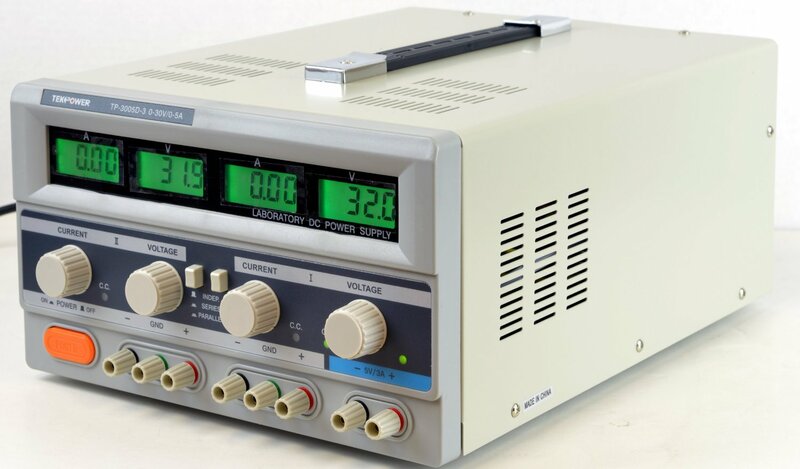 When I started looking for a power supply, the idea I had in my mind was a Dual Channel 30V 3A linear power supply I used before in my school's lab, which had separate controls for constant current and constant voltage output. I do not know what brand it was, but it was very nice to use. In addition, I often work with relatively high-power projects, so I knew I wanted one with reasonably high power capability. Finally, I didn't want to break the bank for the supply. With this in mind, I came up with a checklist and began my search. I knew the high quality HP / Agilent power supplies were firmly out of my budget. 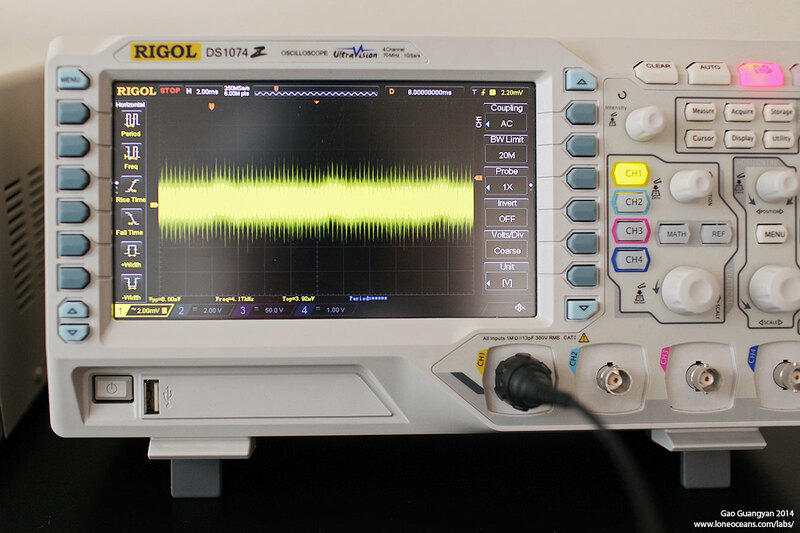 However, having had a fantastic experience with my Rigol oscilloscope, I went to check out what Rigol had to offer. 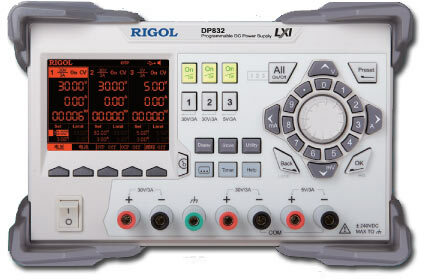 Rigol power supplies - $800 for the DP832A and $450 for the DP832, going up to $980(images from rigolna.com). 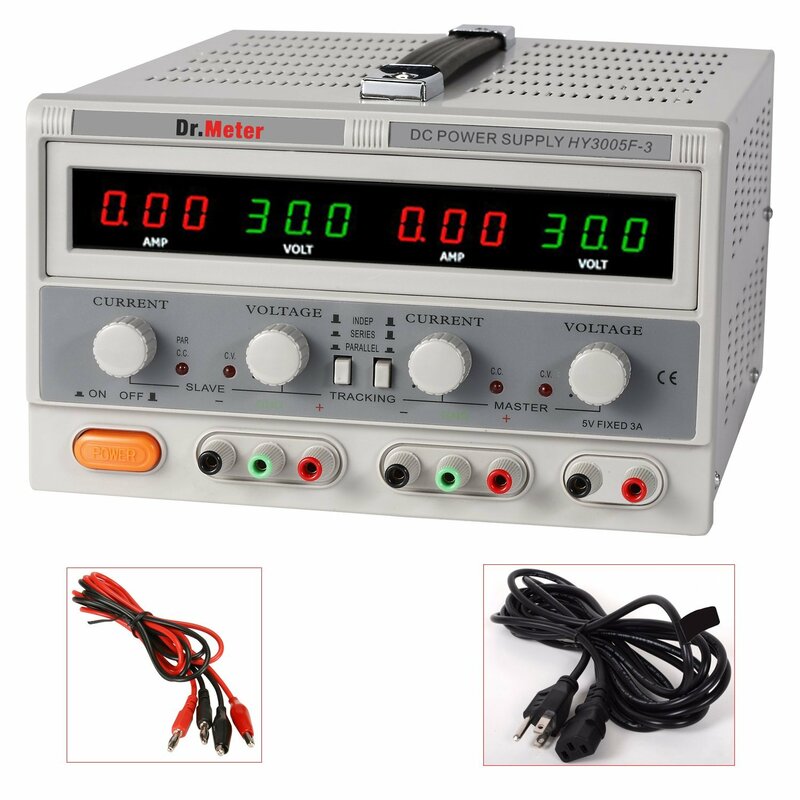 These power supplies are excellent power supplies, such as the entry level precision programmable power supply DP832 (195W Triple output), or the higher performance DP832A. 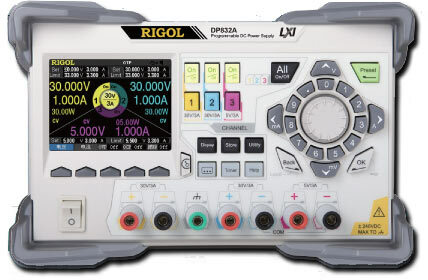 Dave Jones from the EEVblog gave an excellent video review of Rigol's power supply offerings, but the cost of half a grand put it firmly out of my budget. I also looked at cheaper alternatives such as BKprecision, Instek, etc, but it looked like I wouldn't be able to get any reasonable dual channel supply for anywhere near $200. I also browsed Ebay, but the heavy nature of power supplies mean that shipping would be a significant cost of any supply. Eventually I looked on Amazon.com and I found a bunch of of supplies for reasonable prices and free shipping! 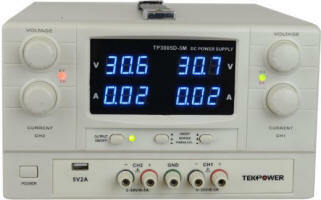 Tekpower TP3005D-3, Mastech HY3005F-3 and Dr. 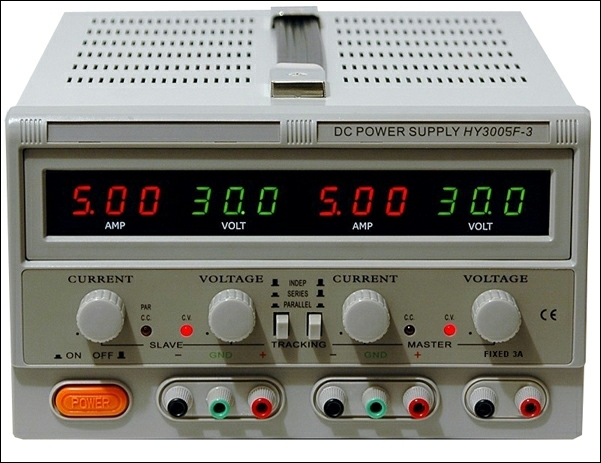 Meter HY3005F-3 Power Supplies (images from amazon.com). They were all selling for between $180 to $190, and were the three main 3-channel power supplies on Amazon. I knew I could get the half sized single channel supplies for about $100, but I knew I wanted at least two channels, so these three look like they would fit the bill. I also knew that I should revise my expectations given that these are certainly very similar cheap-chinese PSUs, and therefore I wasn't expecting much from them in terms of performance and precision, but that is ok for my purpose. 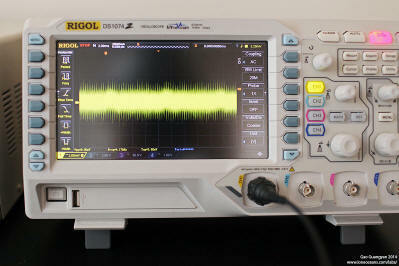 If you are working with more sensitive low-power circuits, the Rigols look like the way to go. 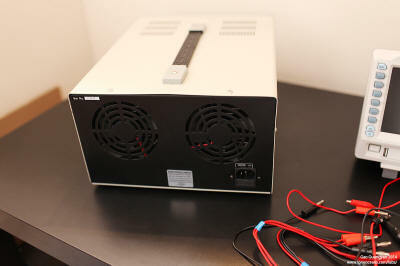 The power supply that had the best review on Amazon was the Mastech HY3005F-3 (they are all 30V 5A supplies), but it strangely had the image of the Tekpower on the page! A quick read in the comments suggest that they were actually selling the supply in the middle in the photos above. In fact, the supply was recently re-branded as Dr. Meter, and Amazon was now shipping the supply as shown on the right! I was a bit annoyed by this, mostly because the front-panel of the supply looked very cheap and ugly, but I did a search on the internet to see if anyone had done a review or teardown. Sure enough, I found a review on the EEVblog forum. The review was by jamesp15 and he/she was nice enough to include some good photographs of the Mastech HY3005F-3 and its internal guts. Lets take a look. 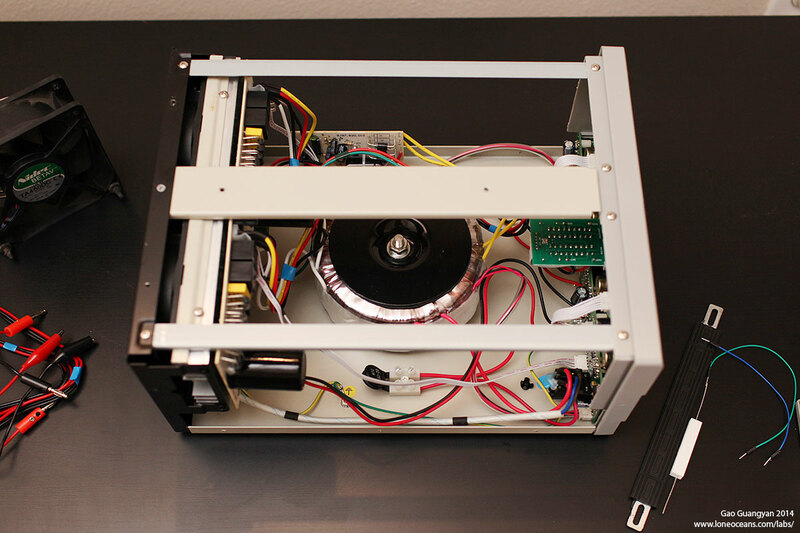 - Surprised to see a toroidal transformer, which is usually more expensive, but more compact and with less EMI. Was expecting a cheap square transformer! 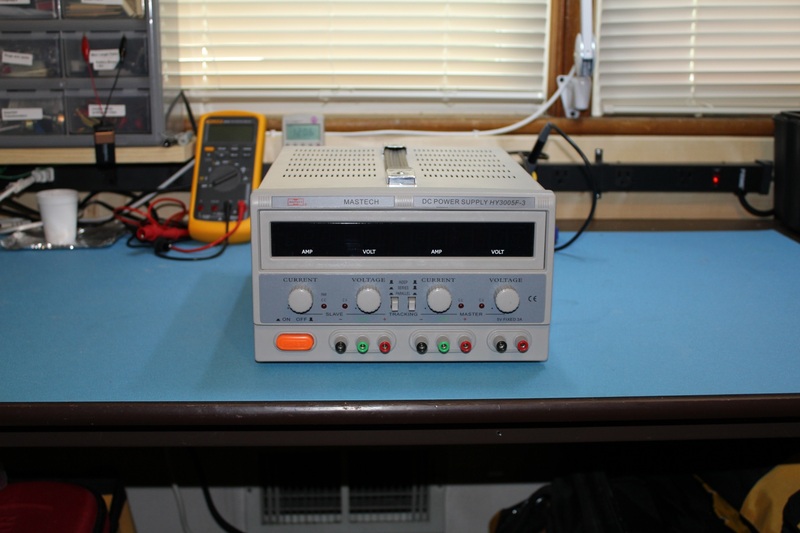 Overall it was exactly what I had expected for a $200 chinese power supply unit, though to be honest I was quite disappointed at the poor quality of the through-hole boards and the overall cheapness oozing from the cheap metal box. Contrast this with how beautiful the Rigols and Agilents look inside. It looked like almost all of the cheap 30V 3/5A power supplies on the internet were essentially identical but rebadged versions of this supply and probably all rolled out from the same factory, so realized I didn't really have much of a choice though. So I thought I might as well try to find at least one with a less cheap looking front panel, i.e. the original Tekpower. 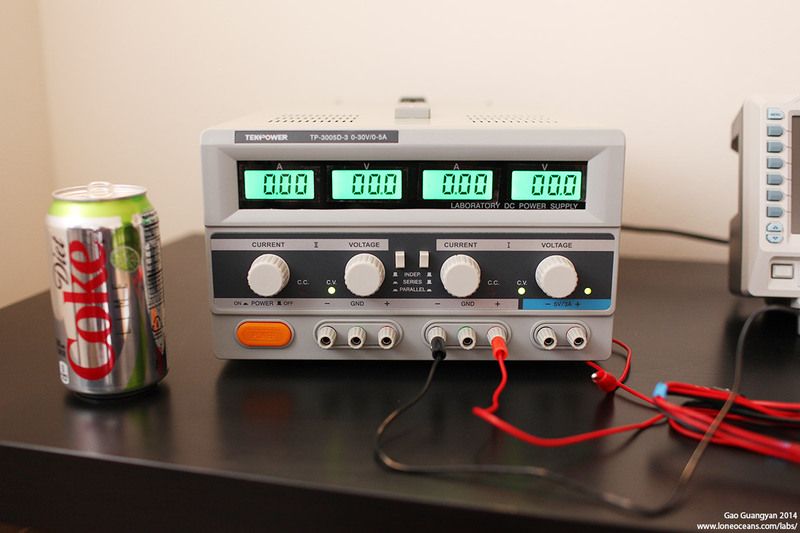 Fortunately, I found that Kaito-usa was indeed selling that original TekpowerTP3005D-3 on Amazon right here! I couldn't find if tekpower was a legitimate brand or not, but it did seem that there were variants of the TP3005D around the internet! Different power supplies, same name! Go figure! The one for sale on Amazon is on the left. Very puzzling. But one thing stood out to me about the Tekpower versus the Mastech/Dr. Meter supplies. 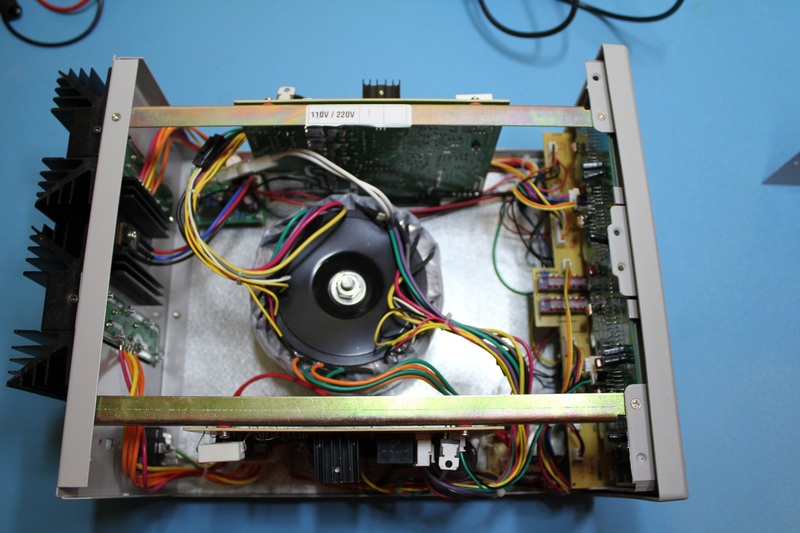 It had a completely different construction due to the fact there were no heat-sinks at the back and much less holes in the case, meaning that this must have a completely different cooling mechanism. This made me think that the people who made this thing must have put a bit more thought into this, and must be a different design from the Mastech. So I decided to take a risk and get the Tekpower! 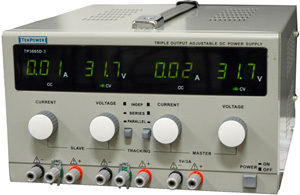 The Tekpower TP3005D-3, front and back. Note the bright electro-luminescent displays and dual 80mm cooling fans on the back. The power supply arrived in typical Amazon style, in two boxes. It was very well packaged though, so I have no complaints at all. The power supply actually came in much nicer quality that expected and I really like the matte powder-coat they had on the entire package, instead of the usual cheap-looking glossy finish for cheap products. I it did make a good first impression. The next thing I noticed was that it didn't have a 220/240V switch on the power input, which was a bit disappointing. Another thing was I was concerned about was the poor-looking quality of the LCD display, but it turned out that the backlight was a very nice green electro-luminescent display and not a cheap LED, so that was a nice touch. The display does become a bit more difficult to read from above though, so that's one limitation. I'll talk about the construction in the next section - let's see its electrical performance first! 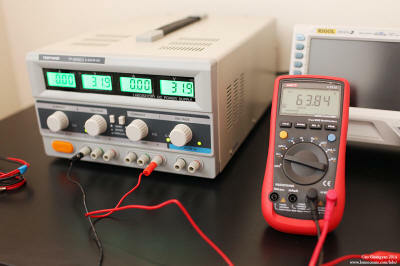 I checked all three outputs with a variety of voltages, currents and loads, as well as the maximum and minimum outputs. In short, everything was within specification, expect that it struggled to provide the maximum 30V at 5A. Here I am using my Uni-T UT61E multi-meter, which in my opinion is one of the best meters you can get for only $40 shipped! Excellent multi-meter for the price. The output for each channel goes up to about 31.8V or so per channel with a maximum combined for 63.84V with no load in series.. The 5V rail read about 5.030-5.040V with no / small load, dropping to 5.012V at 500mA, well within the 3% quoted accuracy. The voltage and current readings were basically within the least significant digit, again well within the specification of 2 counts, and reasonably consistent across different loads to the last significant digit. To be honest, I wasn't expecting the supply to actually be able to supply 30V at 5A, because this is a huge 150W power channel. 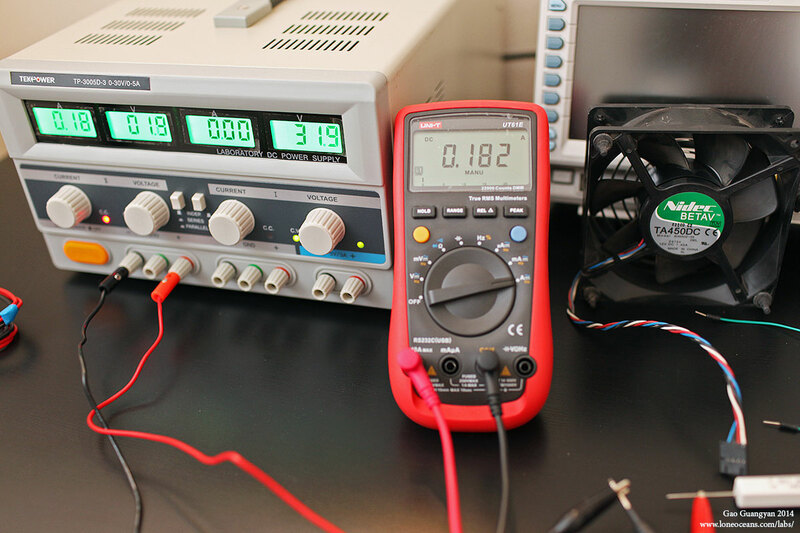 However, I was pleasantly surprised that, using whatever power resistors I had on hand, that it was actually able to supply at least 5.2A at 29.6V! That's more than what I realistically expected and more than enough for what most people would need. I wasn't able to test both channels at max load at the moment, but I'll update this page as I continue testing it. 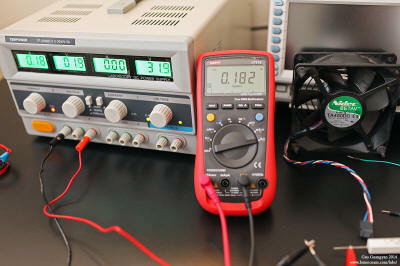 The voltage and current readouts are basically working as expected. Next I tested shoot-through and transients during switch on and off. 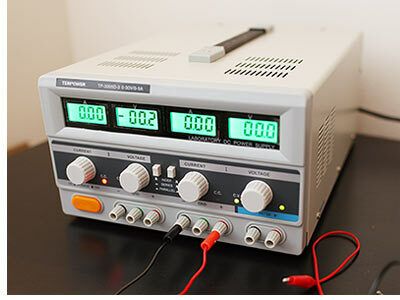 Performance was quite similar for a variety of different voltages and loads, with a small transient at the beginning ranging from 2 to 8V or so, and usually a stepped response up to the set voltage. That said, if I was working on a critical circuit, I would probably just disconnect the circuit before turning it on. The transients tend to decrease with the larger load. Turn off transients are similarly small or smaller. As for shoot-through, the supply tended to take a step-function before going to the correct voltage, and the only shoot-through I did see was perhaps around 10V with no load where it shot to 11V before coming down to 10, but this disappeared with a load. How about noise and regulation? I found that the supply was reasonably consistent through the range with differing loads, dropping slightly with a heavier load, but they were all hovering around 8mVp-p at 20Mhz bandwidth, which is well within the 20mVp-p specification. Good enough! (More tests to come soon as I use it more and more). Now time to take it apart! I talked about the good first impression of the product, but lets take a look in more detail. After unscrewing something like 10 screws, the innards are revealed! - Nice big toroid transformer! 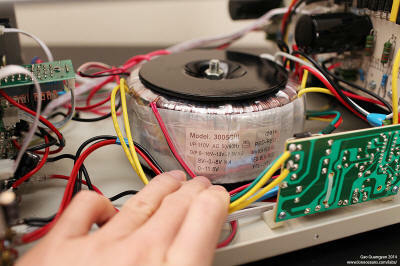 One thing I wanted to point out was the use of the nice metal rib at the top of the case where the handle attaches to. This is much more sturdy in my opinion than the Mastech construction where the handle looks like it's just being supported by the thin metal shell, which will invariably flex since the supply is quite heavy. Overall, weight balance is excellent. Lets take a closer look at the front-panel boards. This was very surprising because it looked like really high quality double sided SMD boards, one for the main controls and the other for the display. It was fun to see how they had one controller individually driving each LCD panel. 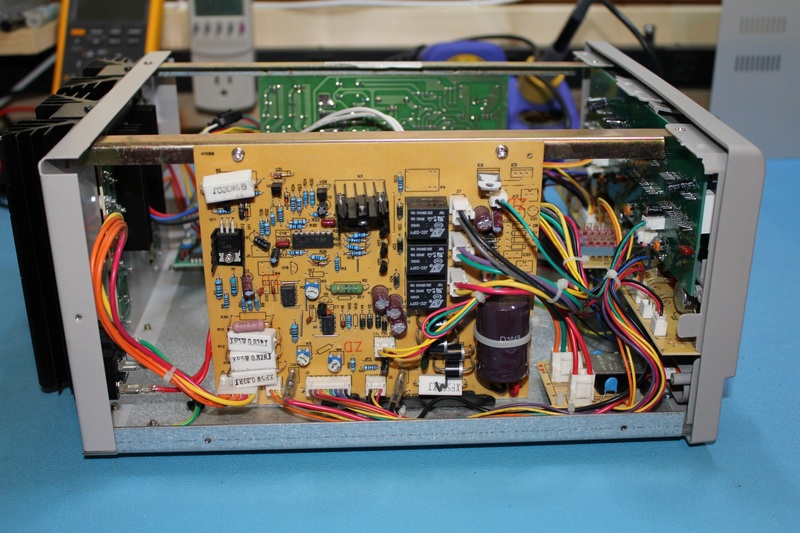 This connects neatly via ribbon cables to the main control board, which contained a smattering of TI Op-amps such as the usual LM324 and OP07C low-offset voltage operational amplifiers. It also looks like the crappy single turn potentiometers will be simple to replace with proper multi-turn pots, and is a mod that I plan to be doing in the near future! Looking great so far. 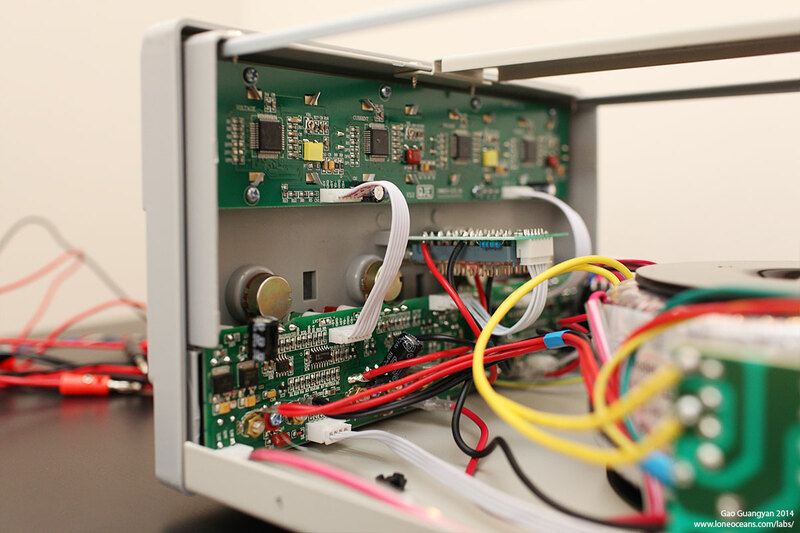 Lets now look at the back boards and a daughter-board, which house the power circuits for each channel + the 5V rail, regulated by a LM723CM voltage regulator. 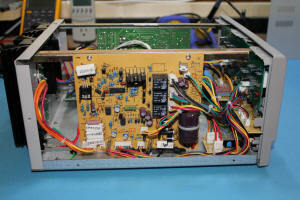 The boards are also populated with Hong-Fa JQC-3FF sub-miniature relays with 15A switching capability, and look to be on-par for the course. The two huge filter capacitors are 63V 6800uF. All caps seem to be 'C' branded 105C, but nothing I recognize. Otherwise, reasonably neat and clean construction. One thing I really quite liked was the nice extruded heat-sink with a total of 9 TIP3055 transistors, with a thermocouple which turns on the fans once it hits 50C. 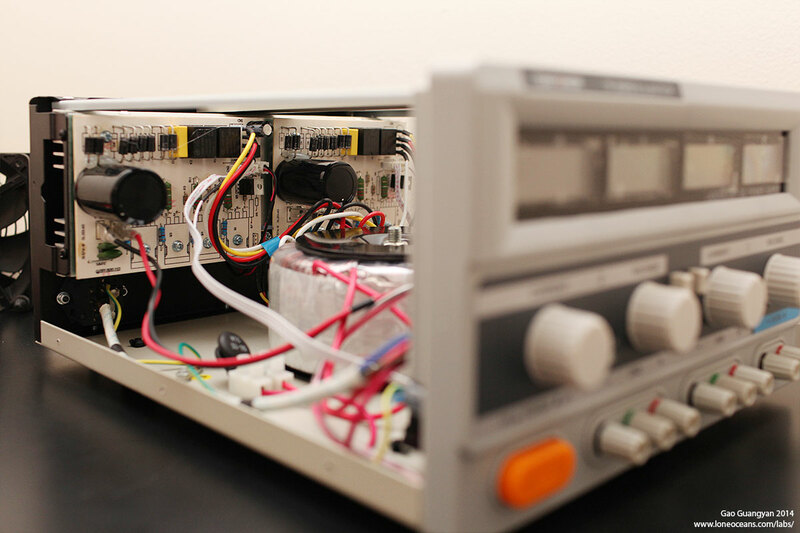 Each channel uses 4 of these TO-247 transistors in parallel with the 5V rail using one. While I don't really like how the big capacitors are just sitting there sideways, they have gone to the effort to at least hot-glue them down. 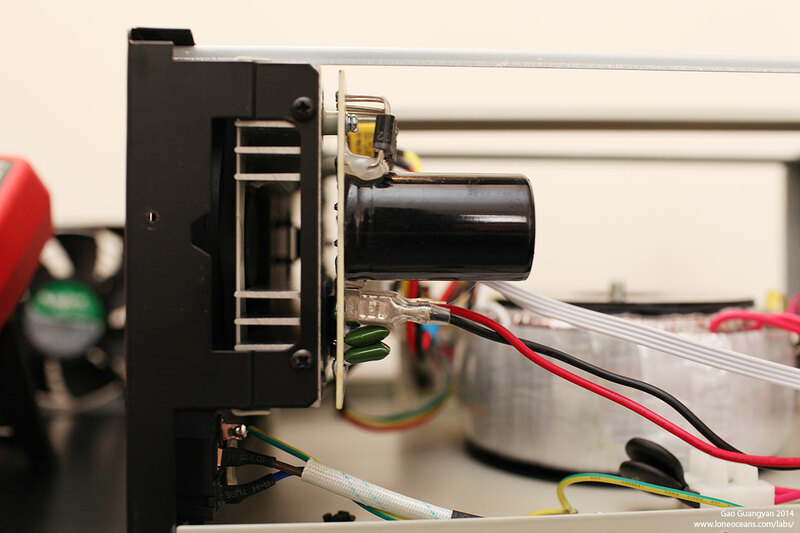 Also note the proper extruded aluminium heat-sink, not some cheap folded sheet-metal ones. Overall, I was pleasantly surprised with the higher quality construction which I was certainly not expecting! 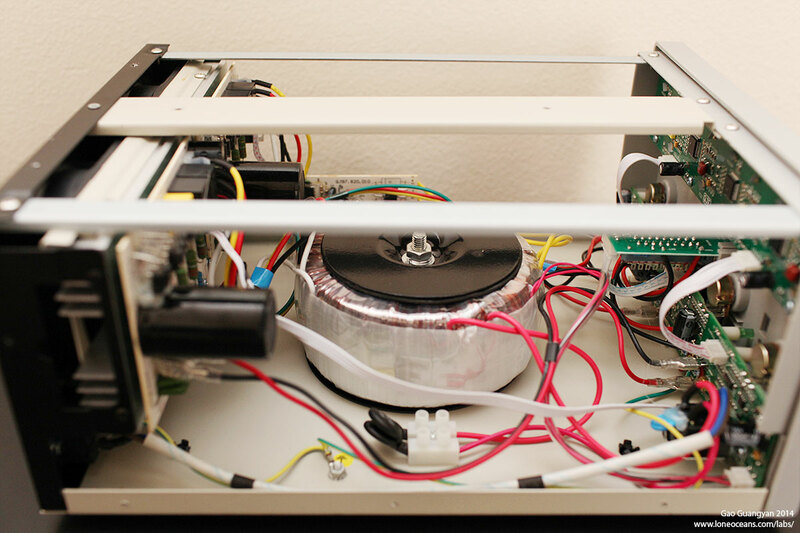 It certainly has room for some simple modifications such as swapping out the crappy potentiometers with multi-turn ones for much more accurate control. Definitely a completely different product from the Mastech! So what do you think? 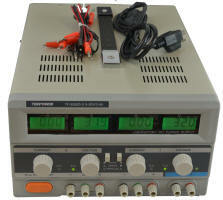 To summarize, the Tekpower TP3005D-3 (at least the one pictured here!) is a completely different product from the similar-looking Mastech / Dr. 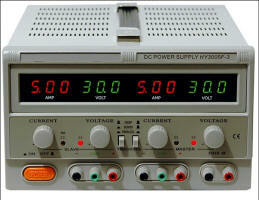 Meter HY3005F. It has much better internal construction, a nice big toroid transformer, and measured ~8mVpp CV regulation (well within the 20mVpp specification) at 20Mhz bandwidth. 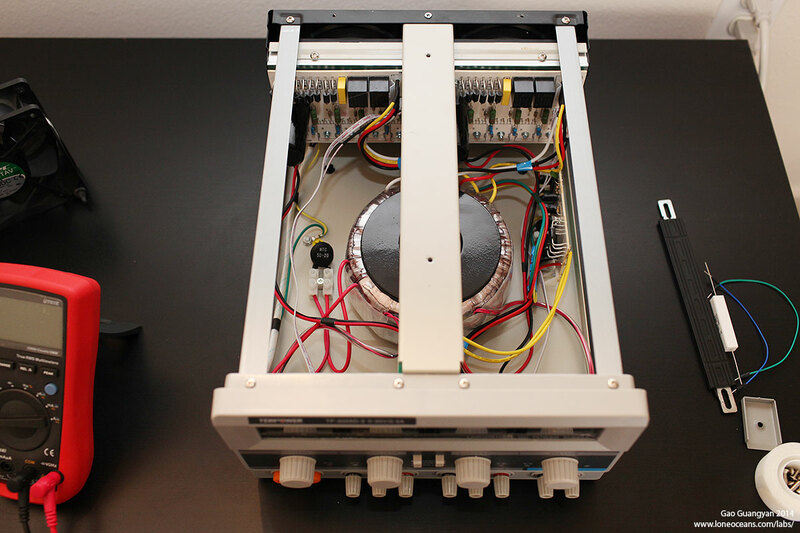 Output goes up to 32V per channel, and uses a generous amount of TO247 TIP3055 transistors with a well-designed active cooling system. 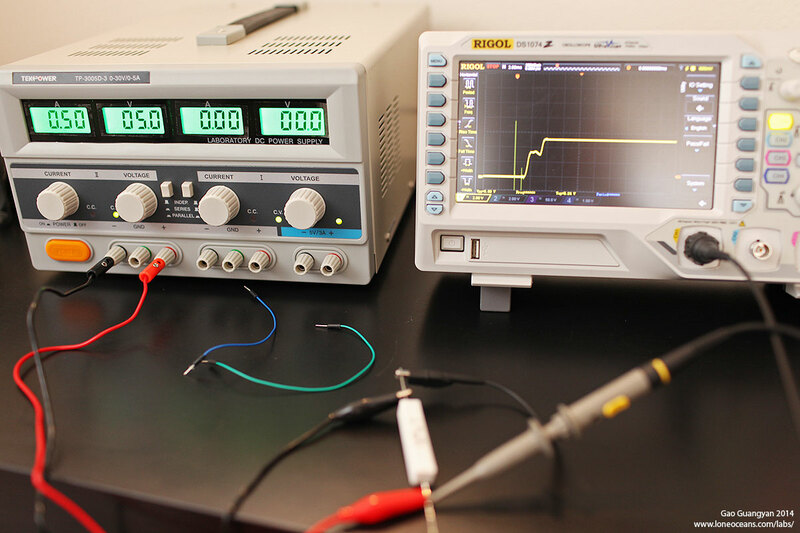 I have tested it at up to 5.2A 29.6V per channel, so it looks to be able to supply at least 150W per channel (haven't been able to test maximum load for the entire device yet). Negligible overshoot (if any) which basically disappears with any load, but I would still be careful with connecting my circuits and toggling the on-off button just to be safe. 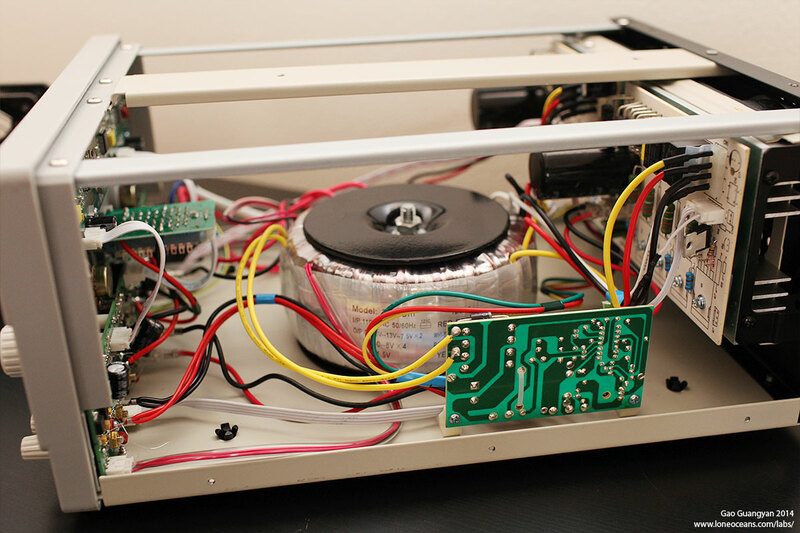 The things I want to be improved the most would be a selectable switch for 240V operation, and multi-turn potentiometers for voltage / current control. Overall, much better than I had expected and an excellent value compared to any other product for sub $200. 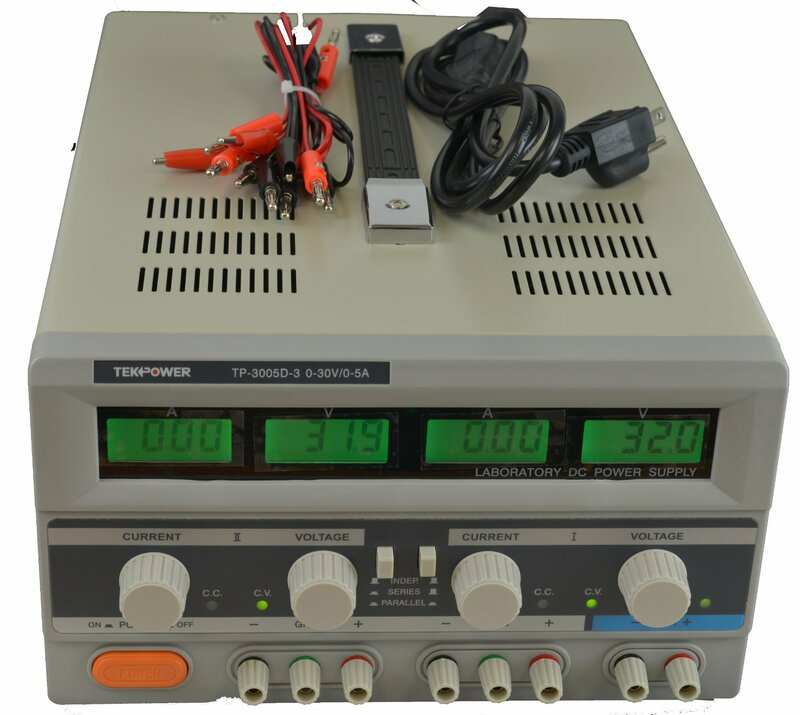 For any one looking for an affordable non-precision power supply, I will have to recommend the Tekpower; for anything else, probably a better idea to grab one of the Rigols. More to come soon as I continually update this page as I test the power supply more. After buying this from Amazon, Kaito-USA (distributer) included in the box a 1-yr warranty card as well as a note saying that if I left a review on Amazon, they would send me a 'mysterious gift'! I wrote a review on Amazon and I'll update this page when I receive their 'mysterious gift!'. 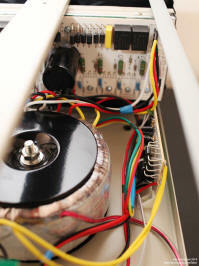 I also plan to upgrade the front-knobs to something better, so more to come soon!